At the December 13, 2016 meeting, Robert was appointed to the Rensselaer County Legislature as a representative of District 4. Loveridge has a deep knowledge of county government, and years of community service with organizations including Kiwanis. Loveridge served from 1994 to 2010 as Superintendent of the county Correctional Facility, after working in other capacities in law enforcement during a distinguished career of over 37 years. 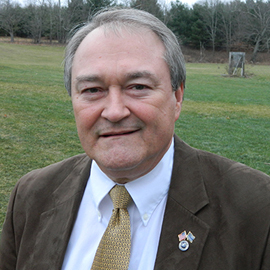 He has also held various roles in Kiwanis in the county, including Distinguished Division Lieutenant Governor representing seven Kiwanis Clubs in the county, and is Kiwanis Division Coordinator for the “Bells of Life” fund raising campaign for the Children’s Hospital at Albany Medical Center Hospital – Pediatric Trauma and Neo-Natal intensive care units. He is current Vice President of Castleton-Schodack Kiwanis, and Past President of Sand Lake Kiwanis. He now serves as a member of the Sand Lake Kiwanis Board of Directors. As jail Superintendent, Loveridge was responsible for management of the facility. In that role, he interacted with every level of county government, and represented the Sheriff’s Department on a number of issues with county and state government. Loveridge’s law enforcement experience includes service as a police officer, correction officer and training technician and facility review specialist for the State Commission on Correction. Bob is an adjunct professor of criminal justice at Hudson Valley Community College and since retiring as jail Superintendent, he operates a company specializing in security training. He is a Past President of NY State Chapter of the American Correctional Association (NYCAYSA) and a recent recipient of the organizations Rutherford B. Hayes Award for his dedicated years of service to the advancement and professionalism of the correctional field in New York State. He remains an active member of various criminal justice organizations. Bob has a Bachelor of Science (BS) Degree in Criminal Justice from Russell Sage College and a Master of Public Administration (MPA) from Marist College. Bob is presently an Adjunct Professor of Criminal Justice at Hudson Valley Community College and a local business owner and a partner in Flynn & Loveridge Security Training, LLC. Robert is a resident of Schodack.